U-Haul employees are keeping the Spirit of '45 alive by raising thousands of dollars to support the Wounded Warriors Project. The company was the first corporation in America to be invited to sponsor Spirit of '45. 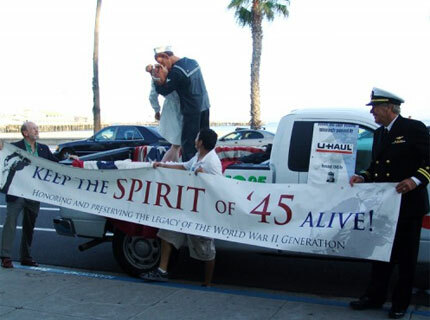 The Spirit of ’45 was in the news throughout the Southwest in October, thanks to National Sponsor U-Haul International and the Sculpture Foundation. 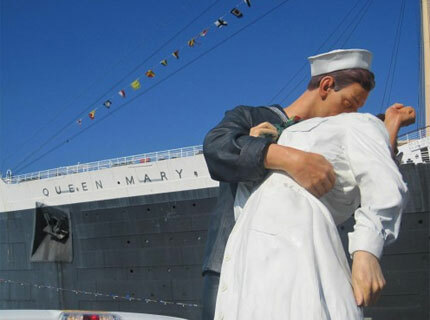 A 6 ft replica of the famous Seward Johnson sculpture depicting the “kiss seen round the world” was transported on a U-Haul truck through the state of California and Arizona to help promote public awareness about National Spirit of ’45 Day. The 6-day tour included visits with residents and staff of state veterans homes, veterans groups, and community leaders that organized Spirit of ’45 Day observances during the past two years in Central California, Los Angeles, Long Beach, and San Diego, before arriving in Phoenix, AZ for a special tribute to Wounded Warriors that was held at U-Haul Headquarters on Friday, October 21. Joanne Fried, Director of Communications, asked that the Spirit of ’45 “statue” be part of its Wounded Warrior tribute as a symbol of the importance of assuring that returning veterans from every era receive the recognition and support they deserve for their service, especially those who made exceptional sacrifices defending our country. 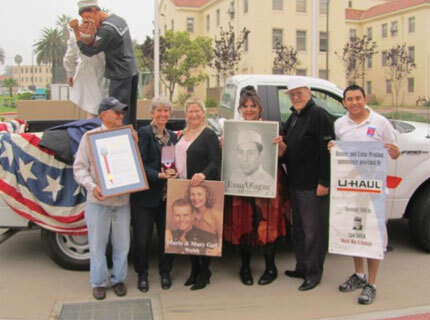 U-Haul has a long tradition of supporting veterans and their families. Founded by a WWII Navy veteran in 1945, the company was the first in America to be invited to help support the Spirit of ’45 initiative when it was originally conceived on the historic Queen Mary on August 14, 2008. U-Haul EVP Stuart Shoen present a tandem bicycle to two brothers who were wounded in Iraq during the Wounded Warrior Project event held at the company's headquarters in Phoenix on October 21. 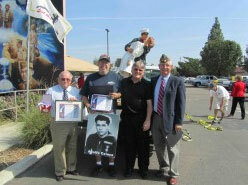 Bob McNabb, Visalia Veterans Committee, Jerry Guevara, 1st Vice Commander AMVETS Department of California, Bill Goodreau, American Legion Posts 18 and 785, are bringing the Spirit of '45 to the Central Valley. 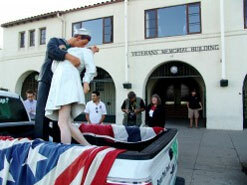 Spirit of '45 in front of Veterans Memorial Building in Santa Barbara, CA. The Spirit of ’45 Tour began with a visit to Visalia, CA where several WWII veterans gathered at the site of a massive mural honoring America’s Greatest Generation. Representatives of the Visalia Veterans Committee, the American Legion, the VFW, the AMVETS and the Wounded Warriors, were recognized during a brief awards ceremony for their collaborative efforts to establish Spirit of ’45 Day in California’s Central Valley. The Spirit of ’45 Tour visited the residents at California State Veterans Home in West Los Angeles which hosted a star studded 2010 Spirit of ’45 Day event featuring appearances by movie stars Rhonda Fleming and Margaret O’Brien, Broadway legend Carol Channing, and Jimmy Stewart’s daughter, Kelly. 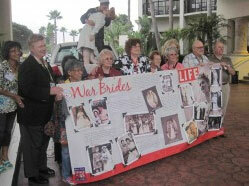 The WWiI War Brides Association have been active supporters of Spirit of '45 since its inception. 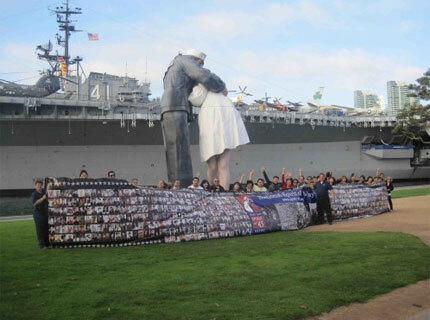 The Spirit of ’45 Tour continued on to San Diego for a brief appearance in front of the 25 ft version of Johnson sculpture that stands in front of the USS Midway in the Greatest Generation Park, where the national campaign to persuade Congress to officially support a permanent annual day to honor the “ordinary heroes” of the WWII generation began in 2010. The Spirit of ’45 Tour stopped by for a brief visit with the World War II War Brides Association, which was founded in San Diego and has been a strong supporter of Spirit of ’45 from its earliest days. The War Brides will be helping promote the “Love Stories of WWII Project” next year, inviting couples who were married during the period 1941-1945 to share their memories and photos with Spirit of ’45. "Wall of Honor" of WWII veterans images in front of the original Seward Johnson sculpture and the USS Midway in San Diego, CA. San Diego will host the Spirit of '45 National Leaders Weekend on February 17-19. 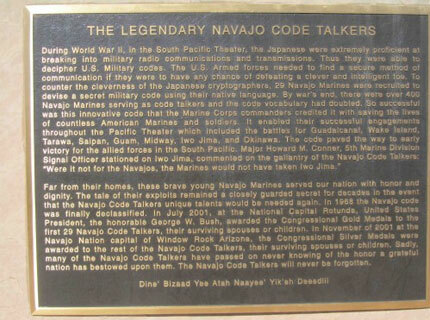 The highlight of the Tour was the visit to National Navajo Code Talkers Memorial at Window Rock, AZ. Accepting the Spirit of ’45 National Leaders Medal were Yvonne Murphy, president of the Navajo Code Talkers Association and three surviving Code Talkers and their family members. 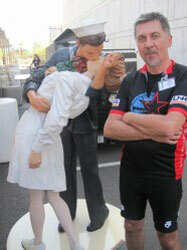 On the final leg of the Tour, the “Spirit Statue” visited the residents of the California Veterans Home in Barstow, CA, 30 of whom drove more than 200 miles to and from San Diego in torrential rains to join Edith Shain and Jerry Coleman on the USS Midway in January 2010 to officially kick off the campaign to secure a permanent annual day of remembrance to honor the achievements of the “ordinary heroes” of their generation. For more photos of the October Spirit of ’45 Tour visit our Facebook pages. 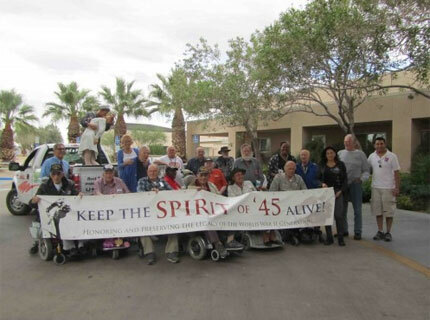 Thanks to all the folks who made the latest Spirit of ’45 Tour such a rousing success! 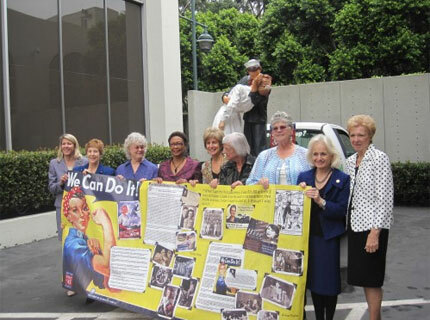 Long Beach Women Leaders with Rosie the Riveter banner and the "Kiss" during the "We Can Do It" Annual Awards luncheon hosted by City Councilwoman Gerrie Schipske. Navajo Code Talkers receive a Spirit of '45 National Leaders Medal during a ceremony held on October at their Memorial in Window Rock, AZ, with Yvonne Murphy (second from right), president of the National Navajo Code Talkers Association. 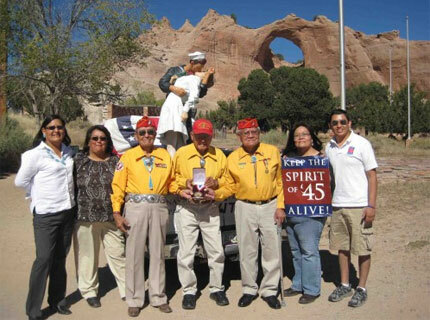 Robert Corpus, National Youth Director for Spirit of '45, who drove more than 1,500 miles in 5 days, takes a pit stop in Utah's Monument Valley en route to meet the Navajo Code Talkers. Bright city lights in Las Vegas as the Spirit traveled back to San Jose.